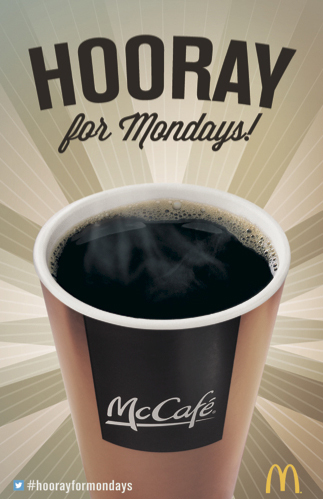 Enjoy a free cup of McCafe Premium Roast Every Monday! 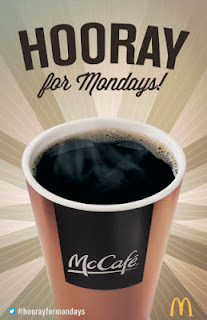 From Nuffnang PH blog - Every Monday, McDonald’s will make you say “Hooray for Mondays” by giving customers a free cup of McCafe Premium Roast Coffee at ALL McDonald’s breakfast stores nationwide! 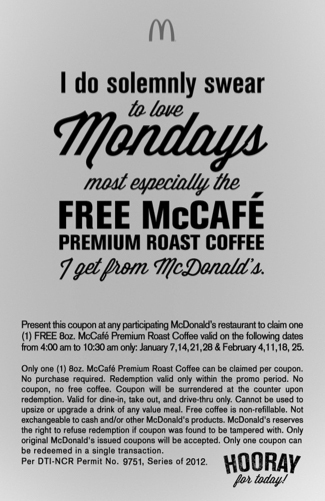 All you have to do is visit any McDonald’s store nationwide every Friday to Sunday to get your free coffee coupons. Present your coupons at any McDonald’s breakfast store on all Mondays of January and February from 4:00am to 10:30am to enjoy your free cup either dine-in, take out, or drive thru. So if you’re a coffee lover, and you dread Mondays, start your day with the smooth and full-bodied taste of 100% premium Arabica beans in every cup of McCafe Premium Roast Coffee. 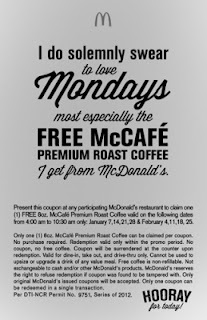 Please take not that the picture of the coupons posted above are not for printing meaning you will need to get the actual coupons on any McDonald branches for the free roast coffee this Friday. If you're a loyal customer of McDonald's that won't be so much of a problem, right?